Calling all bartenders and industry! 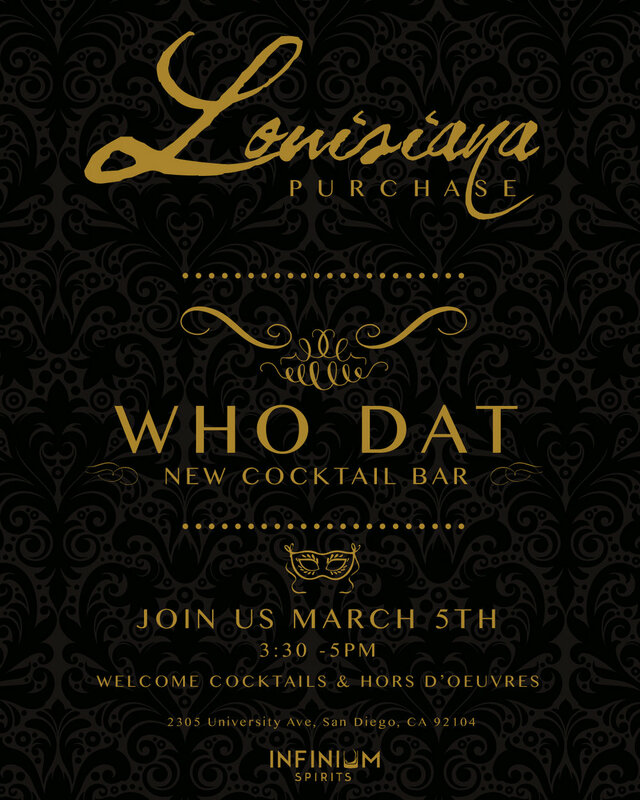 As a part of #BartendersWeekend, you are cordially invited to "Who Dat New Cocktail Bar!?" a Fat Tuesday themed Happy Hour! Woke up late or planning on going to the beach a little later and need a ride? Come by Louisiana Purchase first for a Mardi Gras Inspired happy hour with a twist on some of the famous Classic Cocktails from New Orleans. Come join the team at San Diego's newest cocktail bar, for an Infinium Happy Hour, featuring New Orleans / Mardi Gras themed food and cocktails and live entertainment. Just a quick scooter or uber ride from the Hotel Lafayette, Louisiana Purchase is located at 2305 University Ave. San Diego, CA 92104 in North Park. Guests will receive a welcome cocktail and tray pass hors d'oeuvres. Specialty Cocktails, (New Carre, Hurricane, Specialty Sazerac) thereafter will be $5. We have 100 commemorative pins, which are first come first served. A specialty, themed lunch and snacks menu will be offered for the event. IMPORTANT NOTE: To RSVP click "attending." A bus will pick up and drive everyone down to "No but, No cuts, No Coconuts" at 5:30pm. Only 40 seats available - reserve your spot today! Celebrate with Locale Magazine in Mardi Gras style at Louisiana Purchase, a New Orleans inspired bar and restaurant in San Diego! Enjoy the charm and character of New Orleans while sipping on complimentary craft cocktails and eating delicious appetizers at Locale’s Fat Thursday: SD Issue Release Party. Wander to the upstairs patio where a Speakeasy will greet you with a live brass band, vendors and an exclusive bar. All proceeds benefit a local non-profit.